What if one simple tool could ensure that you never let a prospective foundation grant slip through your fingers again? In the six years I worked in programming and communications for a grantmaking family foundation I learned a lot about nonprofit management just from observing the grant proposals that crossed my desk. Of course there are all the proposals that arrive missing important documentation, like the 501(c)3 letter or the program budget or the annual report. You know, the things requested in the grant application guidelines. But what was the number one reason a lot of organizations failed to get funding? Would you believe the answer is simple follow-up? Many foundations will not tell you. It’s rare that the first-time grant proposal gets funded – no matter how well written it is. Yet you’d be amazed at the many organizations who fail to follow through with a foundation when their grant proposal is declined. I’m guessing that these individuals let loose with a world weary sigh and file the letter with the grant proposal … never to reapply. 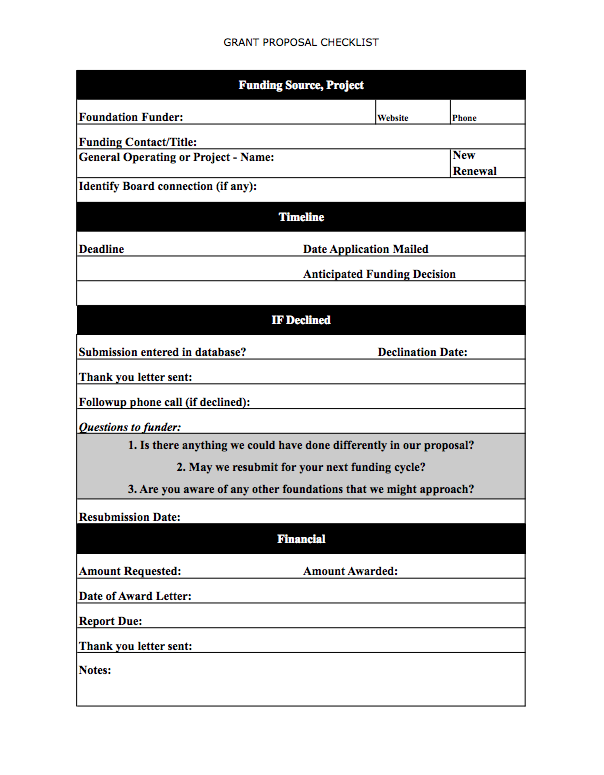 That’s why I created this simple Grant Proposal Checklist. When I introduced the Checklist to my email subscribers my in-box was flooded with responses – from authors, other consultants and nonprofit development directors. “This follow-up sheet for foundation submissions is FABULOUS! I’m going to recommend that all my clients start using it. Thank you so much for sharing this great resource. I really appreciate it, and so do many nonprofits who don’t even know it yet!” Tina C.
It’s just one of the many tools created for the one-person nonprofit development office who needs to do it all – faster, smarter, better. Download it yourself today. You’ll find that it makes creating a system of follow-through a whole lot easier! Previous post: Power of Storytelling | Feeling story-stuck? Here are seven tips to inspire. Power of Storytelling | Feeling story-stuck? Here are seven tips to inspire.